The Protect & Sell Program, matches buyers interested in rehabilitating historic buildings with preservation-minded sellers of unique properties across Maine. Protect & Sell works with buildings at least 50 years old, and not only facilitates the purchase and protection process, it also guarantees peace of mind to individuals seeking to sell and safeguard their historic properties. sale for the first time in 50 years. The Protect & Sell Program seeks to preserve historic properties, generally through an option-to-purchase agreement with the seller that is executed at the time of closing with a new purchaser. We frequently work with a local real estate agent to market the property. Approved properties can be donated to Maine Preservation or offered to MP at a discounted price by the owner; properties are offered for sale based on the market value. Upon resale, properties are legally protected by a perpetual preservation easement and, if necessary, with a rehabilitation agreement spelling out a timetable for completing stabilization. Easements require a stewardship contribution. Established in 2014, Maine Preservation’s Protect & Sell Program markets historic Maine properties and secures buyers committed to maintaining and rehabilitating historic buildings. The Program matches sellers who want to safeguard their property’s future with preservation-minded buyers. We enter directly into real estate transactions and have the ability to partner with homeowners, commercial property owners, land and conservation trusts, environmental and agricultural organizations, historical societies and municipalities to help save historic buildings. Maine Preservation retains preservation easements on Protect & Sell properties to help guide any needed rehabilitation and to ensure preservation of the building. The easement is placed in the deed of the property, runs in perpetuity and gives new homeowners ongoing access to assistance from our Field Service Program. Maine Preservation inspects easement properties at least once annually and reviews any proposed changes to protected features. Distinguishing itself from the traditional real estate market, the Protect & Sell Program provides access to a niche market of buyers across the country who are seeking to buy and rehabilitate historic properties. These buyers are attracted to the rich and unique quality of place afforded by historic properties. The buyers and sellers we bring together view our engagement and the use of an easement as a seal of authenticity, making the organization’s ongoing partnership role and technical assistance a distinct benefit. The Protect & Sell Program is uniquely positioned to help identify buyers who will acquire and preserve historic houses or commercial buildings while Maine Preservation takes on the future responsibility to provide ongoing technical assistance and property stewardship – and even legal defense if necessary. Our experiences show that unlike most conservation easements, preservation easements do not reduce the value of the property. Instead, the easement focuses the market on buyers who wish to acquire the property to preserve it. Although preservation easements have been widely used for decades for historic properties across the country, we have found that many real estate experts in Maine are not well versed in the workings of easements. Maine Preservation staff can explain the advantages of the easement and provide expert technical assistance on often complex rehabilitation projects to help ensure economically practical, long-lasting outcomes. The preservation easement prevents demolition and protects significant features of historic buildings by requiring Maine Preservation’s review and approval on changes to any protected features. Its terms are developed in conjunction with the current owner. In all cases, easements cover exterior features; some have approval or advisory review of interior features. The easement is perpetual and is recorded in the deed of the property. Our years of experience help us clearly answer prospective buyers’ questions and resolve any uncertainties. This same skillset is extremely valuable in selling houses needing substantial rehabilitation. Maine Preservation engages buyers by providing detailed information, referrals and suggesting potential solutions. What does a preservation easement protect? Each easement is tailored specifically for each individual property to protect the historic features the donor or owner wishes to protect. What you want to preserve can be written into the easement. Easements can allow for continued and new uses of a building, prohibit development, allow for additions, and apply to all or a portion of the property. An ongoing goal is to have protected buildings in active use. We want the property to be a functional, habitable space, so changes are allowed as long as essential historic features are not eliminated. Maine Preservation secures a property, generally through a one-year option-to-purchase at a mutually agreeable price based on local market data. We often work with local real estate agents to help show the building and, when appropriate, to help determine a listing price. When a buyer is identified, the option is generally assigned to the buyer who executes it at closing. Our engagement allows for a buyer’s agent to receive an appropriate fee at closing whether or not a listing broker is engaged. Generally, the current owner donates the easement just before the closing. For properties listed in the National Register of Historic Places, the easement donation can be tax deductible. Maine Preservation lists properties on the MLS, CIRCA, the nation-wide Preservation Directory and our own website and social media platforms. We can also arrange with the owner to advertise with the National Trust for Historic Preservation, Down East Magazine, Antique Homes and other media outlets. As one of our marketing tools we develop a floor plan and walkthrough brochure for each property, which is also used as baseline documentation for the recorded easement. Additionally, we prepare a summary of the history of the property and draft a preservation easement and rehabilitation agreement, highlighting the significant historic features of the building, areas of flexibility, and a general description of essential future maintenance. Our staff connects with all interested buyers to explain the history of the property, the easement and the rehabilitation needs and agreements, and is a partner throughout the entire transaction, including closing. The goal of a preservation easement is to preserve and restore the significant existing features of the historic building while permitting updating and modernization of other elements to meet the owner’s current lifestyle. Our easements allow the owner to update the building with up-to-date kitchens, baths, and electric, plumbing and heating systems. Owners find that our assistance is particularly helpful in navigating rehabilitation projects, with or without a contractor or architect. We first work with the new owner to undertake improvements that address deferred maintenance and prevent ongoing deterioration. Typically, these can include addressing any issues with the roof, exterior painting of wood surfaces, repair of doors and trim, and sound wiring and heating systems. It is less important to us how quickly plaster is repaired, interiors painted, or floors refinished. After the closing and any rehab oversight period, Maine Preservation staff and Protect & Sell Committee volunteers conduct annual site visits to review the easement provisions. Staff prepares annual site inspection reports, which are kept on record at Maine Preservation. Our reviews under easements follow the Secretary of Interior Standards, which have been used by more than 40,000 rehabilitation projects across the country since 1977 to bring historic buildings up to contemporary standards. These standards are proven to be adaptable to all building conditions and modern needs. Please note that we typically do not finalize the easement prior to identifying a new buyer, so that the buyer can provide feedback if there are particular areas of concern. The sale price in option-to-purchase agreements ranges from an outright donation to Maine Preservation, a discounted price, or market rate. We may contract for some services upfront such as staff efforts to develop the floor plan and walkthrough brochure, marketing and communications materials including specific materials outlining the historic and architectural significance, and information about the provisions of the easement. Maine Preservation secures an easement stewardship contribution from the sale proceeds, or sellers can make an outright donation to cover the cost of easement protection. In some cases, grants can be used to fund easement protection. The easement stewardship contribution covers documentation and recording of the easement and rehab agreement, legal fees for preparing the option-to-purchase agreement, post-sale review of the rehabilitation plans & construction monitoring, perpetual easement monitoring, and a legal defense fund in the event Maine Preservation must defend the easement in court. 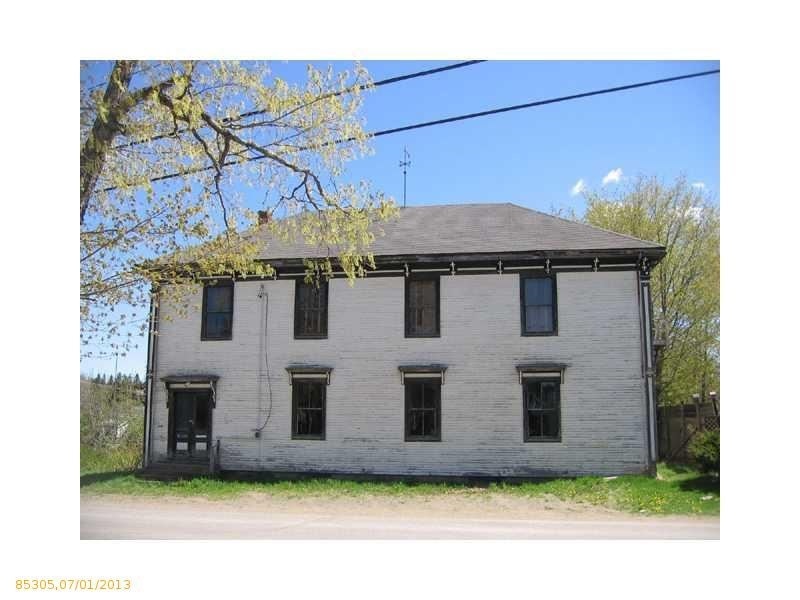 For some endangered properties that meet certain qualifications, Maine Preservation can apply for supplemental support through the Historic Preservation Revolving Loan Fund administered by Maine Historic Preservation Commission. These funds are limited, but can subsidize the easement stewardship contribution and other transaction and protection costs for qualifying properties. Flanked on both sides by similar homes, this 2.5 story Greek Revival sets directly on the town green across from the library. Constructed in 1841 during the middle of the boom time for the City of Ships, it was the home of Dr. Israel Putman, a graduate of Bowdoin Medical School. Dr. Putnam had an extensive medical practice in Bath and served as the Cities mayor eight times between 1859 and 1867. The property had served as the headquarters of the Cosmopolitan Club since 1915 but was purchased in April 2017 by an individual who is rehabilitating the house for his private residence. George Washington Lodge, No. 123 of the Independent Order of Odd Fellows (IOOF), was instituted March 26, 1890 in Pembroke. Six years later, master builder Nathan Foster of Calais erected the Italianate-style building specifically for the organization on what is now Old Route 1/ Old Country Road. The two-story building sits at the old village center of West Pembroke. The property has been well preserved – both on the exterior and interior – and retains virtually all of the original floorplan, plastered walls and original varnished paneled ceilings, wooden floors and doors, window casings and hardware. The property was purchased in June 2017 to host the library of Greenhorns, a nonprofit that works with young entrepreneurial farmers. The lodge will also function as a gallery and community space, bringing back community activity to the village of West Pembroke. One of the finest rural examples of the Georgian-style in Maine, the Abijah Buck House sits on property settled by this French-and-Indian-War veteran and his wife Phebe Tyler Buck in 1777. They were the first family to settle "Bucktown," which became known as Buckfield, named after Abijah. The house retains many of its original elements, including raised panel woodwork in 6 rooms, a corner cupboard and two types of interior shutters, doors, latches, flooring, and stenciled walls by Maine 19th century artist Moses Eaton. The house also contains a 9 foot fireplace--the largest known in Maine. The home was purchased in May 2016 by new owners who are rapidly rehabilitating the property. Located in downtown Norway, the James O. Crooker House stands as a well-preserved example of late vernacular Greek Revival style. James O. Crooker, a noted tinsmith and hardware dealer, built the house about 1865. In 1864, he purchased a hardware business on Maine Street from Thomas Higgins. Shortly thereafter, he built a brick hardware store in its place, similar in style to his home. The house retains many original features and decorative elements such as its Doric pilasters and entablatures which frame both the house and the main entry, and the corner block trim that decorates the interior window and door frames. Decorative painted tin adorns the ceiling in the living room and parlor, likely a legacy of the builder’s profession. The structure comprises the house, an ell, and a two-story attached barn with a gabled roof that contains a circular window and faces the street. The home was purchased in January 2016 by a local couple who are rehabilitating the property. The Robbins-Anderson House was built by South Thomaston’s founding family, Oliver and Chloe Robbins, who settled in 1762. The current house was the family’s second house on the property, built circa 1795 and was renovated about 1870 to include Greek Revival details. About 1900, Isaac and Rosa Anderson, natives of Finland, purchased the property and in the early 20th century donated a small piece of their land for the Finnish Congregational Church. The house and 5 acres had remained in the Anderson family until the sale. This house was purchased in June 2015, and the new owner, who has local ties, is working to rehabilitate the main house for use as an art gallery, the back sheds for craftspeople and the foundation of the former barn as a sculpture garden.